The Rotary Backing Plate Extension enables you to perform what we like to refer to as surgical buffing. The Rotary Backing Plate Extension places the backing plate and buffing pad farther away from the body of the rotary polisher so you can more easily see the small, intricate area that you’re working on. Rotary polishers are direct drive tools – meaning they need to be used with care – and the Rotary Backing Plate Extension enables you to be precise and accurate with the tool, ensuring perfect results every time. Polish small and intricate panels with precision! If you’re using a 4 inch or smaller pad on a rotary polisher, more than likely you’re polishing small or hard to reach areas like a-pillars or complex body panels. With a small pad, you need to see exactly where the edge of the pad lies and the Rotary Backing Plate Extension makes this possible. By moving the backing plate and pad farther away from the body of the tool, you’re more easily able to see the exact contact points of the pad. This ensures you don’t run the pad over a body line while also guaranteeing that every surface of the vehicle that has paint gets polished. The Rotary Backing Plate Extension also works great with the Grit Guard Universal Pad Washer. When the polisher is equipped with the Rotary Backing Plate Extension, you gain about 2 extra inches of travel which makes it easier and more effective to clean your pads. This also means that your hands are less likely to get wet from residual splatter while using the pad washer. 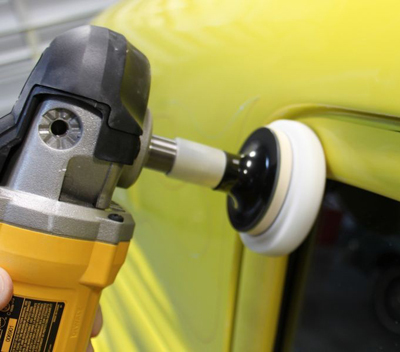 Polish small and hard to reach body panels with precision by equipping your rotary polisher with the Rotary Backing Plate Extension! Note: For use with rotary polishers (5/8 inch thread) only.